I love Rainbow Rowell and consider her to be one of the greatest young adult authors today. I have read all of her books and I am in love with everything to do with her writing. Out of all of her books, the one I am most obsessed with is Fangirl - which I read just over a year ago. The one thing that kept me hooked to Fangirl was the element of the fictional world of Simon Snow (a Harry Potter-esque character). 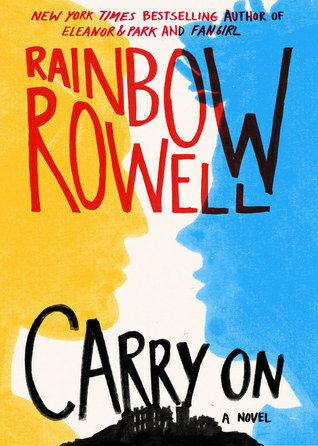 I loved reading Cath's fanfiction about his world and I often found myself wishing that Rainbow Rowell would bring out a book all about Simon and his adventures. So you can imagine my excitement when Carry On was released. Carry On takes place during Simon Snow's last year at Watford School of Magicks; his girlfriend Agatha breaks up with him, his mentor - The Mage is avoiding him and his Nemesis and room-mate Baz is missing. Just another year in his life. I know some of you may be thinking that it's a bit odd to have the story start during his last year, however lots of things from his previous years at Watford are explained throughout the book. I was confused at first, but once things got explained to me, I was hooked. This book is not your typical fantasy, and you will be surprised at the twists and turns throughout. Rainbow Rowell has brought a unique style to this genre that has never been seen before. People have compared it to Harry Potter, but I have to disagree and say that although it is about a school of magic, it is totally different in many ways. Instead of wanting to go to Hogwarts, I guarantee that you will be wanting to go to Watford by the time you finish the book, trust me. I loved the relationship that blossomed between Simon and Baz. It was interesting to see them go from enemies, to acquaintances, to friends, to something even more. Hearing their petty arguments and disagreements just had me bursting out laughing, the two characters were definitely something else and I don't think I've ever read about characters like them before. Carry On is probably one of the best books I have read in a long while. It kept me hooked with it's wild fantasylike plot, interesting and somewhat funny characters and unique concecpt. Rainbow Rowell has done it again, and right now I am wishing that she'll write more books about Simon Snow's world, as now I have had a taste of it, I want more.